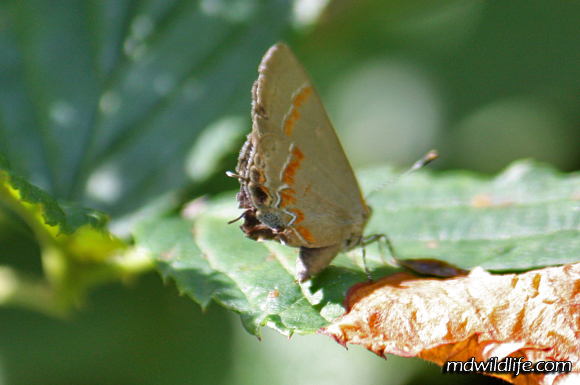 The Red-Banded hairstreak has a bright hindwing pattern. The Red-Banded Hairstreak (Calycopis cecrops). Admittedly, this is a terrible photo, but it does do a good job of displaying the very pronounced banded markings on the hindwing of the Red-Banded Hairstreak. This is the only photo I have of one, and I wasn’t really sure I caught anything different from my usual hairstreaks until I got home and looked at the photo. My only experience was in October, so I am thinking it is a late season species. Hopefully I can see more with future trips to provide a little more info.